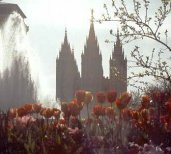 Tuesday’s Seattle Post-Intelligencer carried an Associated Press article about the LDS Church’s Temple Square, located in Salt Lake City. Touted as “Utah’s hottest tourist destination,” the article notes that Temple Square receives 3 to 5 million visitors each year while Utah’s five stunning national parks put together had only 5.3 million visitors in 2005. “Even a quick, 30-minute tour of the grounds reveals a history of epic American drama and Western adventure: Smith’s death at the hands of an angry mob; early Mormons fleeing religious persecution in the Midwest; controversy over a church doctrine (officially abandoned in 1890) that endorsed polygamy; and Mormon pioneers who trekked across the plains in 1847 to find refuge and build a city near the shores of the Great Salt Lake. This reads as if reporter Jim Graham is connecting the synopsis of the Mormon story he’s just related–the “history of epic American drama and Western adventure”–with the caveat that this history is a “church-sanctioned” version that should be taken with a grain of salt. It comes as no surprise that the LDS Church has designed Temple Square as a proselytizing tool. There, Mormon Church history is presented in a faith-promoting way, intended to evoke the strong emotions of sympathy and longing from visitors. The friendly sister missionaries present the Mormon faith in the same “church-sanctioned” fashion, being rather selective in which aspects of their religion they will and will not discuss. As the tourist season is now upon us, perhaps some of you will be visiting Salt Lake City and Temple Square in the near future. In preparation for your trip I recommend you visit Temple-Square.org, a web site operated by Mormonism Research Ministry. Here you will find additional historical information about the LDS Church that will be helpful for you to know. I went to SLC on a two week trip, I used my vacation pay and drove from St Paul mn to go their, I slept in my car execpt when I needed a shower, then I rented a motel room. I brought one friend with me. Boy ain’t that the truth. I carried a triple combo out in the open every where I went, The missionarys spoke openly with us once they saw my book. They asked us, who are you, where are you from, and what are your goals here. I openly told them, Rick Beaudin from st paul mn, and I am here to share the real Jesus with you. I figured they asked me so I was honest and open with them. But the one time I went to them with out them asking me first, they called security on me. The guy was as big as frankinstien, and dressed like an FBI agent. He ask me what we were doing. I told him we were asking questions. He asked me what kind of questions. I told him, well why is it Mormonism teaches no forgivness for people who commit murder, yet JS shot and killed two people? I asked about Adam God and Pologamy, then the security gaurd told me point blank, WE ARE NOT ALLOWED TO ASK QUESTIONS THAT CAUSE CONTRVIRSY. He told me if we dont stop we will be removed. Tell me that the LDS are not selcitve in what they are allowing people to speak about. Another time, I was asking hard questions with in a little tour group, One lady said out loud, WOW I never knew that, Right then and their, the Two missionarys took me and my buddy aside and took the rest of the group in a different direction. If that is not flat out deceitful I dont know what is.